Romantic Novelists' Association Blog: Romance? A 'bloke's' point of view! Romance? A 'bloke's' point of view! After discovering Mike Clarke's blog, where he mentioned in glowing terms his first NWS report, we felt it only fair he was invited to write for the RNA blog. Welcome, Mike, to what we hope will be the first of many reports for the RNA. The other blokes supping in the pub placed their pints on their beermats and stared at me with bewilderment. ‘That don’t sound like Mills and Boon – that’s what life throws at all of us,’ Old Pete said. I’d never seen him stare at his tobacco pouch and Rizlas so wistfully. ‘If they’re finding the right person to spend the rest of their lives with then I couldn’t think of anything more romantic,’ Kim said, polishing glasses and glancing at James, as if seeking a reaction. Well, that’s how I’d imagine my characters reacting if I walked into the pub at the centre of my novel and declared that I was now an extremely satisfied member of the RNA New Writers’ Scheme (NWS). I suspect similar conversations or raised eyebrows would follow in any British pub or across typical dining tables. Of course, it’s not that men don’t write fiction in which romance plays a significant role, it’s just that when we do it seems to be termed anything but romantic fiction. Over the past few years I’ve met many other male writers on novel-writing courses and I’d dare say the majority have been busy at work on books that wouldn’t fall far foul of the RNA NWS’s entry requirements of ‘romantic content and love interest [that is] integral to the story’. And wouldn’t that definition neatly apply to a certain novel with a short title that’s recently been published to huge industry anticipation – whose male author’s phenomenally successful previous work unashamedly charted a famously slow-burning love affair? Perhaps it contravenes an unwritten law of marketing or just that we chaps are rather coy about wearing our romantic hearts on our sleeves but my membership of the RNA NWS has so exceeded my expectations that it’s been well worth risking the odd ribbing down the pub. For those who aren’t aware, the RNA NWS offers unpublished writers the benefits of RNA membership plus a comprehensive reader’s report from one of the scheme’s expert readers, all of whom are published romantic fiction authors. Until I eagerly devoured my own report I didn’t realise how comprehensive or expert the feedback actually is. In fact I worried I’d disqualified myself from receiving a report at all, nervously submitting my manuscript with a covering note tentatively mentioning its use of very strong language and some unconventional romantic ingredients – such as graffiti art, TV cookery contests and compromising photographs being leaked on the internet. Despite being a love story at heart, I feared it would be filed in the ‘Romantic Fiction? Who Are You Kidding?’ bin. My panicky preconceptions were set aside when my reader wrote that she’d thought the novel was both interesting and enjoyable. I must thank the scheme’s organiser, Melanie Hilton, for finding such an appropriate reader (who must remain anonymous according to the scheme’s rules) for my manuscript at a time when she’ll have been incredibly busy. My novel has developed during City University’s intensive one year Novel Studio course and this summer I graduated from Manchester Metropolitan University’s MA course in Creative Writing so I’m accustomed to receiving feedback on my work. However, the RNA NWS report was equal in detail and rigour to that I’d received on the university courses. Particularly invaluable for me was its completely fresh perspective. I was challenged to re-evaluate and question some elements of the novel that, after working for so long on the manuscript, were almost as invisibly familiar as old furniture. And my reader reminded me of hard-edged commercial realities – the type of readers who’d be likely to be interested in my book and what their particular expectations would be from a novel. Creative writing courses are great for honing your writing style and learning to use feedback from tutors and peers to improve your work. But, even courses that focus on novel-writing must, by necessity, workshop students’ writing in relatively small chunks of a chapter or two. By contrast, the RNA NWS will read your novel in its entirety – just as your target reader would – and provide comment on how the book works as a whole. This is almost worth your manuscript’s weight in gold and, if you’re lucky like me, your script will be marked-up for proofing too. My report certainly wasn’t uncritical but it was also very constructive and I’m currently busily revising my manuscript in the light of the report’s insightful recommendations. But it was enormously motivating too – in fact some of its praise made me blush like a Jane Austen heroine. And it’s this encouragement, given in a generous-hearted spirit that seems to me to make the scheme unique. As an organisation with a passion for romantic fiction, it’s inspiring that the RNA actively nurtures and fosters new talent. No wonder the scheme is always over-subscribed. Of course, I’m only able to talk about my own positive experience. However, I’m optimistic that it will help strengthen my nearly finished novel’s chances of publication to the point where I become one of that very rare species – a male graduate of the Romantic Novelists’ Association New Writers’ Scheme – and I hope many more men become enlightened enough to do the same. 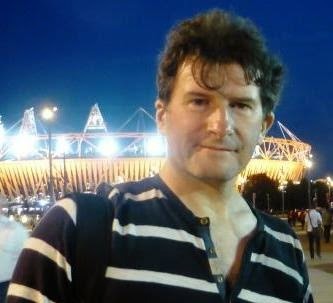 Mike Clarke recently completed a Creative Writing MA with Manchester Metropolitan University and is currently using the feedback form the RNA NWS to put the finishing touches to his first novel. His short stories have recently been performed at the award-winning Liars’ League spoken-word evenings in London and Leicester. He lives with his family on the slopes of the Chilterns. His blog is at www.macnovel.org.uk and can be found on Twitter as @macnovel . The RNA blog is brought to you by Elaine Everest and Natalie Kleinman. Thanks for having me on the blog. I'm happy to answer any questions about my experience with the NWS or any other points that my blog post may have raised. It's great to hear of your productive experiences of the NWS - and good luck with the novel. I was really interested in what you were saying about gender. Yes, I think you're right about men's reticence towards a genre that's called romance, especially if publishers have a tendency to splash pink over too many book covers. But it would be a shame if men were deterred from writing about relationships (and exposing their sensitive sides -- I'm sure they exist if you dig deep enough) by the way books are marketed. I wonder if this a catch 22 situation where the way books are marketed influences what genres writers are drawn towards? Any thoughts? Also, although your book doesn't sound stereotypically feminine, how would you react if a publisher or agent asked you to use a female pseudonym or gender-neutral initials as a condition of taking up your book? Sally, thanks very much for your comments and fascinating questions. The whole question of marketing romantic fiction is probably worth a few blog posts on its own. I went to an interesting session on Women's Fiction at York Festival of Writing where some frustration was expressed by the delegates at the methods publishers use to supposedly target women readers (like sparkly covers with shopping bags and shoes on) and some women writers wanted their books to be marketed with less attention paid to their gender or their readers'. I can't see a fundamental problem with a man writing a romance. There have been so novels that told classic love stories in the past (think of The Great Gatsby, pretty much anything by Thomas Hardy, D.H.Lawrence - although he's seemingly fading from popularity now -- there are so many) that I don't think male writers have changed (although we may be more genre focused?). I suspect a lot of male-written romance tends to be sold on a comedy angle or some other genre. Also, when I was looking through my new Romance Matters, I noticed one or two male faces at the RNA conference and a couple of names in the articles/directories so it's not as if men are totally unrepresented as writers of romantic fiction. I believe there are a few men who write very successfully under a female pen name - as your question points out. If it was thought I could write convincingly from a female perspective (my novel currently alternates between male and female POV) then I wouldn't rule this out -- but I'd probably have written a different book to the one I'm currently finishing. As for the tactic of using initials to appear gender neutral (as in J.K. Rowling, S.J.Watson) then I'd probably defer to the advice of an industry professional. I wouldn't want to deliberately mislead readers but I also believe in my novel enough to want it to be published and be read by as many people as possible. Lots of fingers crossed on that one. Romantic Fiction covers an enormous range, from short stories through category romance and much of women's fiction, to the classics. The nature of romantic fiction means that most of these novels are written and read by women. The RNA, however, boasts a number of very successful male authors amongst their membership. Carole Matthews: What a Celebration! Editing: What do authors' miss? Large Print: Another string to your bow? Jane Lovering: Problems with technology! Sheryl Browne: It's Been Quite a Year!